If you need root canal treatment, or have suffered a cracked tooth, endodontic procedures are required from the dentists at the Yuba City Dentistry Group. Endodontics is the branch of dentistry dealing with tissues and structures found inside the tooth. The most common endodontic procedure is root canal therapy. If you have a bacterial infection that has progressed to the pulp of the tooth, root canal therapy eases the pain, but it does much more. The true aim of root canal treatment is to clear the infection, protect the tooth from subsequent infections, and extend the life of the tooth for years to come. Root canal treatment is the most common endodontic procedure. However, endodontics also deals with a wide range of dental trauma, including microsurgery and diagnosis of intermittent tooth pain, or pain that is not restricted to one tooth. Behind the enamel, the hard outer layer of the tooth crown, lies a hard and bony tissue called dentin. Softer than the enamel, but still very strong, dentin makes up the bulk of the tooth beneath the enamel. It is also found behind the cementum (a calcified substance covering the root). At the center of the tooth, is the dental pulp. This soft tissue consists of nerves, connective tissue and blood vessels, sitting inside small, branching chambers called root canals. If the pulp becomes inflamed or infected, an individual often experiences sudden tooth sensitivity. He may feel pain when chewing, and may eventually feel a constant, throbbing pain. The pain may eventually subside as the nerves die; but without treatment, the infection will eventually spread and the tooth falls out. What causes the dental pulp to become diseased in the first place? Risk factors for tooth decay include a diet high in sugar and/or poor dental hygiene. As bacteria from the surface of the tooth gradually works its way inside, the tooth becomes infected. In rare cases, routine orthodontics procedures lead to problems with the root canals. No matter what the cause, root infections must be dealt with as speedily as possible to limit damage to the tooth and prevent its loss. 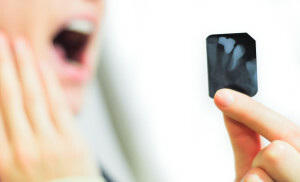 If you’ve experienced root canal problems, you know they are no laughing matter. Root canal treatment effectively relieves pain while extending the life of the tooth. With the expert application of analgesics and perhaps even oral sedation with sleep dentistry, root canal treatment won’t cause any more discomfort than getting a filling. First, you’ll receive a local anesthetic (typically with a numbing drug). Next, a small opening is made in the surface of the tooth, providing access to the pulp chamber and root canals. Thereafter, tiny instruments (called files) are used to remove dead and infected tissue, and then the passages are cleaned, disinfected, and filled with a protective material. Finally, the tooth is sealed, preventing further contamination. Following the procedure, the dentist may decide to add a filling or place a crown on the tooth, to fully restore the tooth’s function and appearance. At this point, the tooth should last for years to come, preserving your natural smile, jaw structure and chewing ability.